Stunning, newly-renovated, open plan apartment on the 1st floor with floor to ceiling windows looking out to sea. 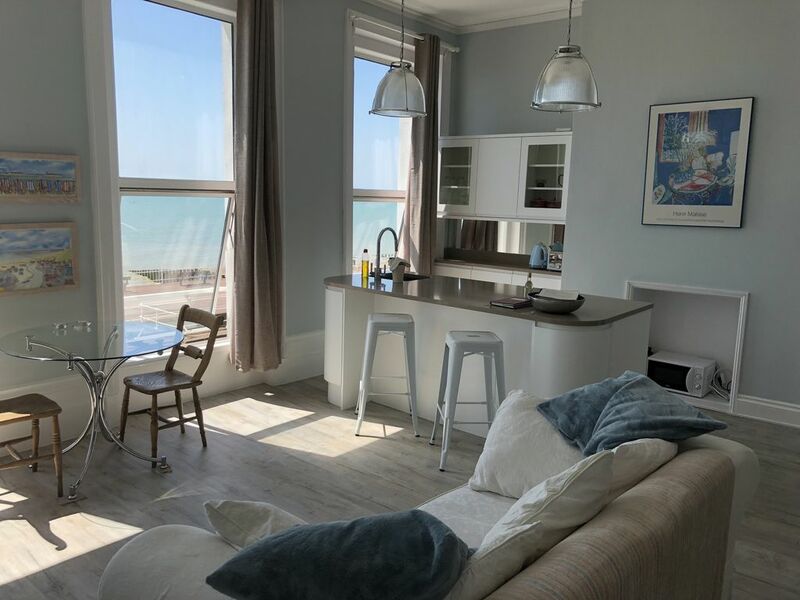 Hastings Pier and St Leonards train station are 5 mins walk and there are plenty of restaurants & bars within easy walking distance. In the bedroom, open the huge double doors and you can lie in bed and still see the sea! Modern, en-suite bathroom. I never tire of the view from this apartment! When the sun is shining you could be in the Mediterranean and even when the weather is bad, you can snuggle on the sofa in the warmth and watch the sea rage. Contemporary en-suite bathroom with walk-in shower, basin with heated mirrored cabinet and separate loo. Joining instructions in the flat. A small portable radio and a bluetooth speaker. A few board games and some puzzles. Had a wonderful time there and Tara was a great host indeed! We really enjoyed our stay quite a bit and would stay again. A charming, tasteful and tidy gem with a stunning sea view I can highly recommend. Thank you Tara for a wonderful week we spend in St.Leonards. Modern eingerichtetes Apartement, direkt am Strand und Zentrumsnah. Das Appartement ist gut ausgestattet und sauber. Toilette und Duschbereich im Schlafzimmer/ gewöhnungsbedürftig.